In a late-night tweet, White House communications director Anthony Scaramucci seemed to accuse Trump's chief of staff of leaking sensitive info — before deleting the tweet as if it had never happened. Just five days into his job as communications director, the White House message guru has spiraled out of control. Making an unhinged, fearful claim on Twitter Wednesday night, which he quickly deleted, Anthony Scaramucci opened yet another front in the GOP’s civil war. Brought in by Donald Trump to improve the White House’s communications, Scaramucci has instead ushered in a new era of determined chaos as the administration careens from one crisis to another. Whether it’s the sprawling Russia investigation, the GOP’s floundering health care push, or the spur-of-the-moment decision to ban transgender people from the U.S. military, a White House known for its undisciplined ways has become even more chaotic and derailed with Scaramucci’s arrival. The supposedly dastardly leak came in the form of a Politico scoop, which reported Scaramucci "earned $4.9 million from his ownership stake in SkyBridge in addition to more than $5 million in salary between Jan. 1, 2016, and the end of June, when he joined the Export-Import Bank, according to a financial disclosure filed with the Office of Government Ethics." By tagging Trump’s chief of staff, Reince Priebus, in the tweet, Scaramucci seemed to imply Priebus was to blame for the leak. The two are seen as bitter rivals, part of the Trump White house’s never-ending palace intrigue. Some in White House are trying to build a case that Priebus is a leaker — “a diagram” charting leaks, per senior official — to show Trump. On Thursday morning, Scaramucci told on CNN, “If Reince wants to explain that he's not a leaker, let him do that." In less than a week on the job, Scaramucci has emerged as a kind of bumbling Inspector Clouseau, as he manically searches for leakers inside the White House. 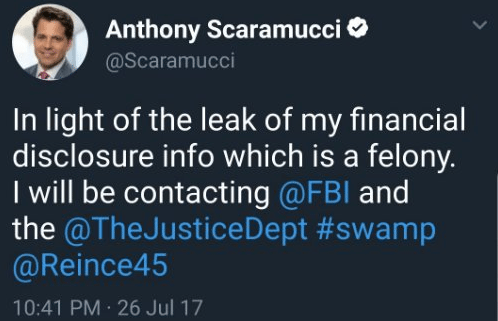 But was the Scaramucci financial disclosure even a leak, let alone an illegal one? Scaramucci’s financial disclosure form “was filed on June 23, which means it could be publicly released by the bank on July 23, or last Sunday,” according to The New York Times. Maybe that’s why Scaramucci, who’s in charge of White House messaging, then deleted the tweet and his convoluted messaging late last night. The stunning Keystone Cops development, where Scaramucci seemed to blame his colleague for a supposedly illegal leak, comes in the wake of the ongoing, and unprecedented, war that Trumps been waging on his own Attorney General Jeff Sessions, who served as one of Trump’s most loyal allies last year. Look for the chaos to continue.